Claire grew up in Southeast Louisiana. While she was in school, Claire participated in Talented Music, show choir and a dance team among many other activities. Upon graduating, she moved to Corona, California to attend the Young Americans College of Performing Arts where she received her Associates degree in Performing Arts. She then traveled with Young Americans all over the United States performing as a featured singer. Claire has spent the last three summers working as a counselor to children with Believe Summer Camp Experience where kids are empowered through performing arts to boost self esteem while learning to pursue their passion through performing. She auditioned and was selected to attend the Judy Stakee “It All Starts With a Song” retreat in Nashville,TN in 2018. She returned to Louisiana to begin working on her songwriting, guitar and piano skills. 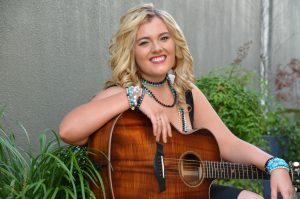 Claire is one of the youngest members of the Northshore Songwriting circle and Troubadours Songwriters group where she enjoys learning and growing from seasoned songwriters. Claire just recently returned from Tennessee where she just cut her first EP of originals. Claire has loved music her whole life and has been include by Adele, Carole King, and Sheryl Crowe.